But, what if would-be cast members had one final chance to get on the show? 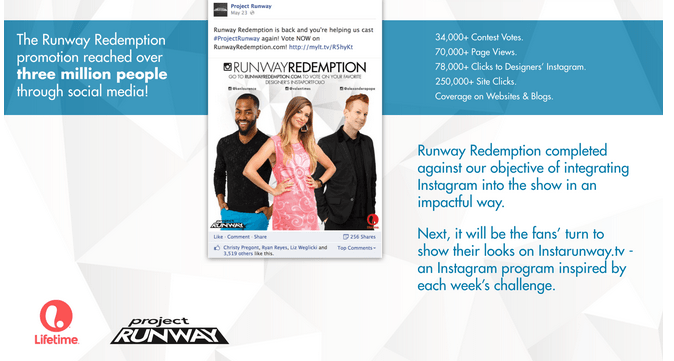 To cast the final member of Season 13, Project Runway launched a Runway Redemption social media campaign on Instagram where fans could vote for their favorite of three aspiring designers. Held over the course of the last season, each designer was asked to build an Instaportfolio by uploading a series of images to their personal Instagram pages, with the hashtag #RunwayRedemption. Images could be examples of their work, something that inspires them, a video introduction, or another creative piece. 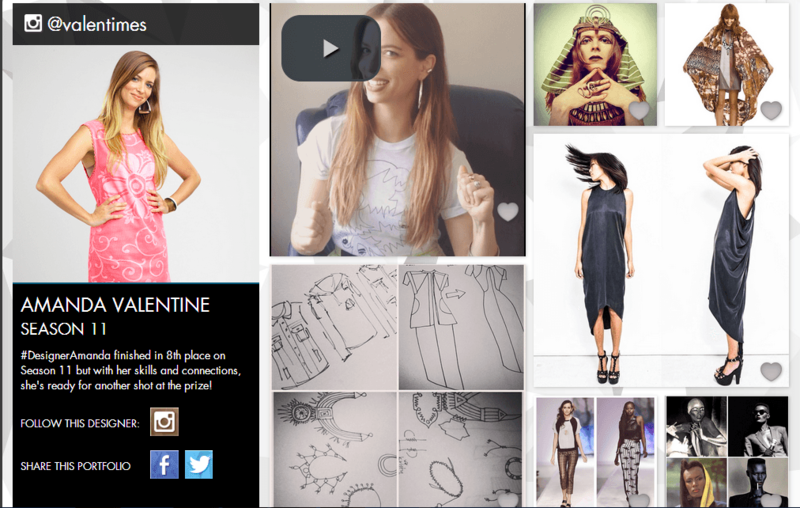 From there, fans of Project Runway were invited to view and vote for their favorite designer’s Instaportfolio on the show’s website. Votes could be logged via “Likes” on the individual Instagram images, or through the Instaportfolio, which used the Instagram API. Following the fan vote, Amanda was announced as the winner of the #RunwayRedemption contest on the recent Project Runway Season 13 premiere. In terms of engagement metrics, Movement Strategy, the agency behind the campaign, shared that the initiative reached over three million people, with over 34,000 contest votes and increased levels of page views, site traffic, and more. 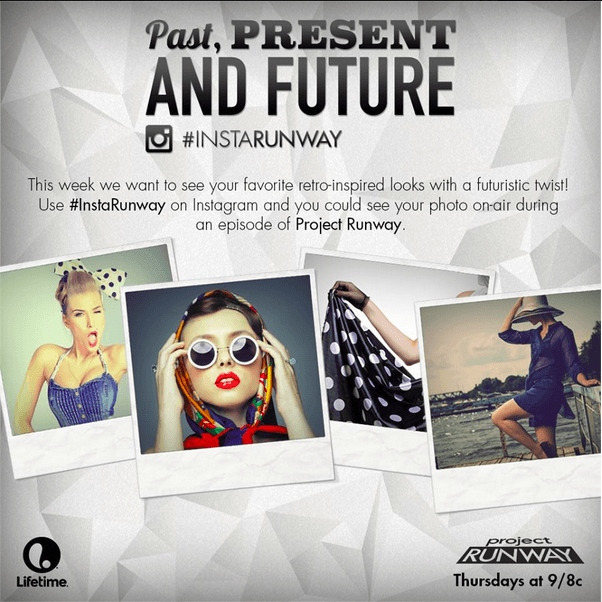 To continue the social media momentum throughout the season, the Project Runway and Movement Strategy teams also used the buzz around the contest to launch an #InstaRunway selfie initiative asking fans to submit Instagram images inspired by the weekly design challenges on the show. Selfies submitted will reportedly be judged than the designer’s mentor Tim Gunn and shared on air throughout the season. Anyone who has watched Project Runway knows what a cult following the show has, so why not involve passionate fans in the casting process? If fans can help rally around would be designers, it gets them excited around the upcoming season while showing the producers who the audience thinks is the most interesting. Even if you’re not casting a show, think of ways that you can bring your audience into decisions – small or large. According to research from Nielsen, 84 percent of smartphone and tablet owners say they use their devices as second-screens while watching TV at the same time. Whether you’re a TV show or brand that is integrating with a TV partner, consider how you can amplify this experience across social media and mobile devices. Look for opportunities like #RunwayRedemption or #InstaRunway that complement the TV experience, versus compete with it. It was awesome to see Project Runway use social media to cast one member of Season 13, but it also begs the question – could the show use this initiative to select the entire cast? Or, could social media help nominate and raise awareness for previously undiscovered talent, or influence ideas for design challenges? The end results could generate a much more social media savvy cast, keep fans engaged between seasons, and create additional integration opportunities throughout the season.